TWIN™ SCANNING is an automotive scanner with an “O” Frame type mechanical structure to measure in transmission mode. More than a standard traditional scanner, this one patented by Electronic Systems uses a unique measurement method. Two sensors equipped with an independent drive are fitted onto the scanner. In addition to ensuring it will operate even in the case of a malfunction, it has a number of advantages for system calibration and quality and speed of the production line response. 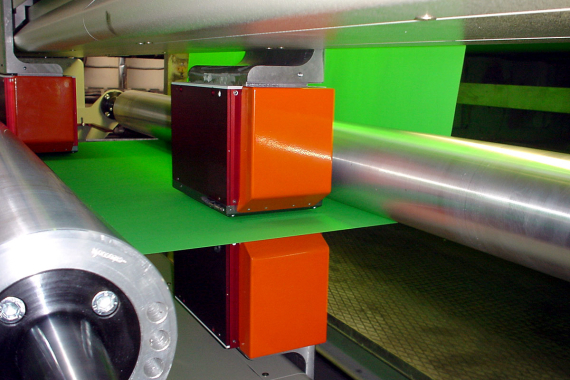 Double read rate during scanning System designed to obtain accurate and fast automatic controls. Self-calibration during production without interruption of reading. Extremely stable sensor shift systems with high mechanical life. Completely fail-safe system: operating even with one sensor only. Category: Scanners. Tags: Adhesive tapes, Biax extrusion, Blown film, Coating & laminating, Composites, Extrusion coating, Nonwovens, Paper, PVC calendering, Rubber, Sheets & foils. TWIN™ SCANNING is an exclusive and fast method for cross-sections evaluation, particularly suited to reduce material waste, mainly when the production process requires fast and precise adjustments.